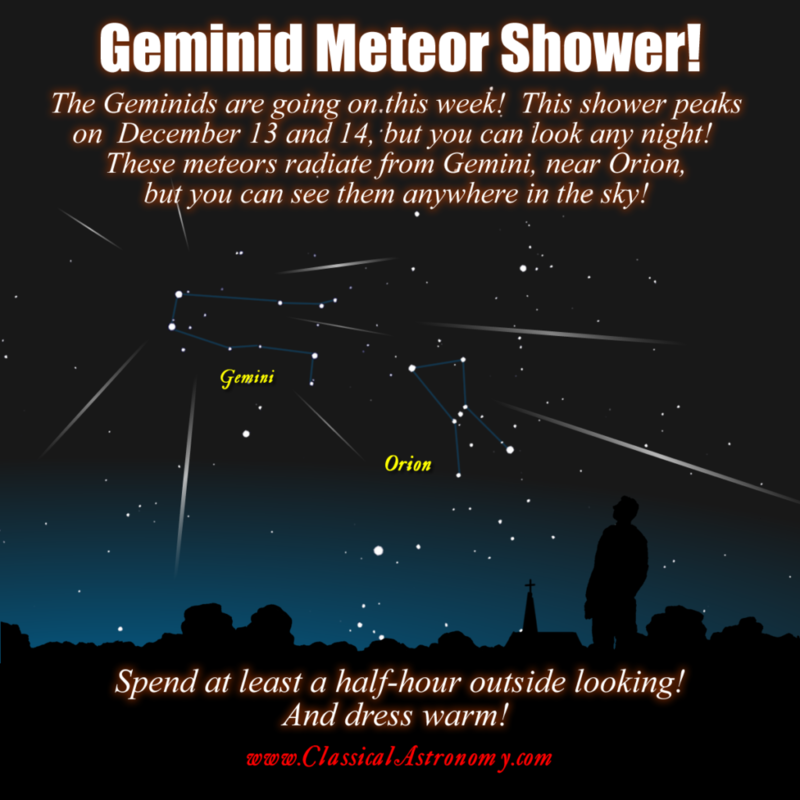 GEMINID METEORS — THIS WEEK!!! The Geminid meteor shower runs from December 6-19, and peaks this Thursday night, December 13/14. But the Geminids are one of the most active showers of the year, and in recent years, have been more active than the more-famous Perseids in August. You can see the meteors in any part of the sky, but they all appear to emanate from the constellation Gemini, north of the famous constellation Orion. In 2018 the glow from the waxing crescent Moon will spoil the evening viewings so look after midnight and/or before sunrise to have dark skies, after the Moon sets. Wishing you clear skies, but moderate your expectations if you live along the ice-encrusted shores of the Great Lakes as I do! For any meteor observation, plan on spending at least a half-hour outside. Don’t poke your head out and expect fireworks! You can hope to see at least a few nice ones in that amount of time, But dress warm! For summer meteors, I recommend pitching a blanket in your backyard, but use your discretion in this cold month!